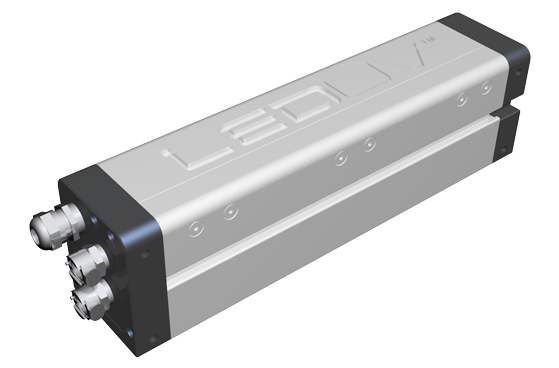 AMS LED UV systems are available in both pinning and final curing versions for specific application in a new generation of production inkjet machines (image courtesy of INX Digital). Eco-friendly LED curing technology is now the standard for wide format inkjet digital printing. 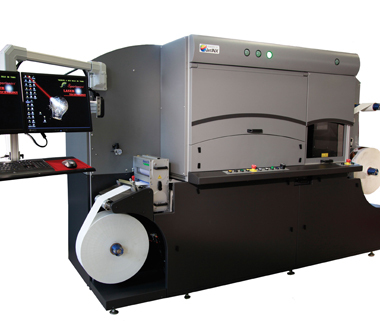 But as inkjet presses evolve to higher speeds in both sheetfed and web applications, and as custom machines are increasingly being commissioned, the demand for high intensity and flexible width LED UV pinning and curing solutions becomes a key requirement. AMS XP3 Final Cure and DFX Power Pinning LED UV systems were developed for the latest generation ink jet speed and effects challenge. Whether wet trapping CMYK at the end of label printer, curing underneath a cylindrical object, or pinning between heads within the print zone, AMS has a solution that works. In most continuous pass inkjet applications, both pinning lamps and final cure lamps are used for maximum effect on multi-color applications. AMS UV LED DFX Power Pinning units deliver between 2 and 4W/cm2 of curing intensity, the highest in their class. And at less than 15mm wide in form factor, they fit seamlessly between print heads without disturbing your print zone. Cooling is managed remotely from the head, so there is not risk of air turbulence in proximity to the drop. AMS DFX pinning heads can be constructed to any emitting length depending on the width of the ink jet head array. And power intensity can be specified at "light" pinning to simply freeze the dot or "power" pinning to "full cure" the intermediate color in single pass applications with heavy ink builds, such as labels. AMS LED UV XP3 Series curing module is available for final in inkjet applications in any width ranging from 3 inches (80mm) to much wider sheet and web widths. AMS final curing units are based on our proven XP1 (4W/cm2) and XP3 (8W/cm2) series technology, an award-winning system available with seamless output in any length, and available in both water and air-cooled editions. Emitting lengths can be tailored to the uniformly cover the entire width of the printed sheet or web. Full intensity adjustment can be made through a simple interface from the press. Unlike other final cure solutions, the AMS XP system is engineered with military-grade electronics and battle tested in demanding production environments around the world, minimizing the risk of downtime. And because the optics do not require placement directly on the moving web or sheet, the risk of contact to the emitter window is greatly diminished, reducing cleaning and maintenance. AMS UV LED technology can be specified on new ink jet presses, and is easily retrofittable onto existing or custom machines from numerous manufacturers. AMS works closely with press manufacturers to ensure the highest integration quality is achieved, and automation features of the machines are preserved.